We got there early. These following pictures are chronological in order. 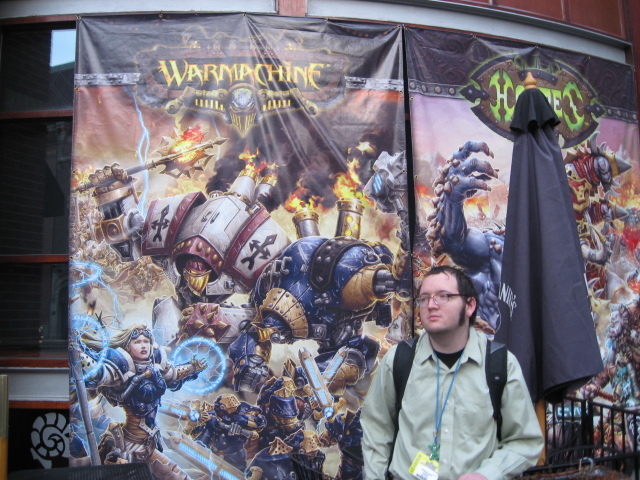 As we walked to the Mariott to run my 9 a.m. T & T adventure we passed these World of Warcraft giant posters stuck onto a business wall in downtown Indy. 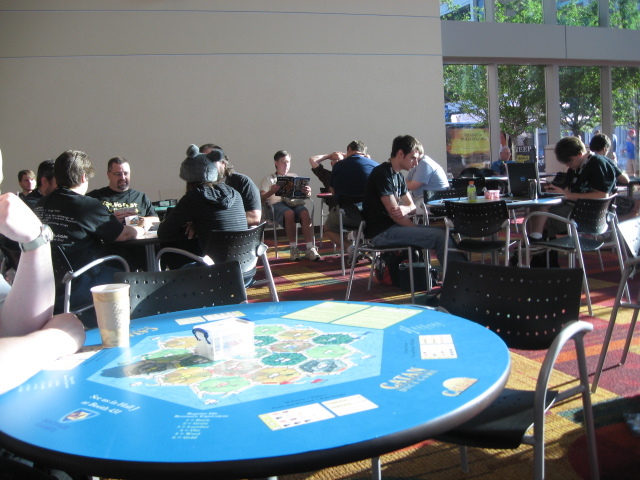 We were early, so we stopped and played some Magic at a Catan boardgame table inside the Convention Center’s open gaming lobby. Mayfair was everywhere with Catan stuff. 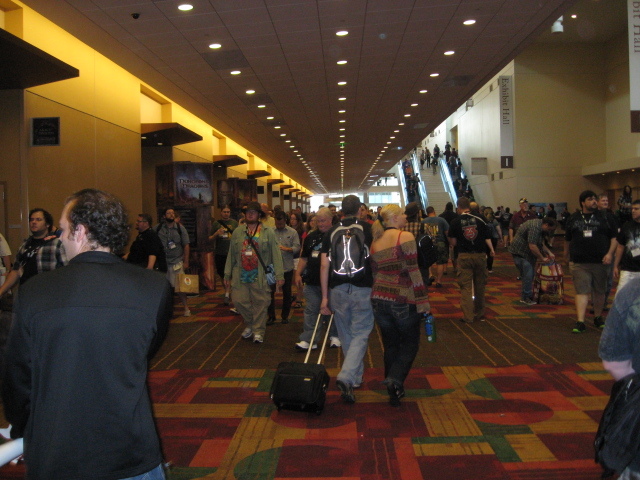 James is making his way through the halls of the convention center. 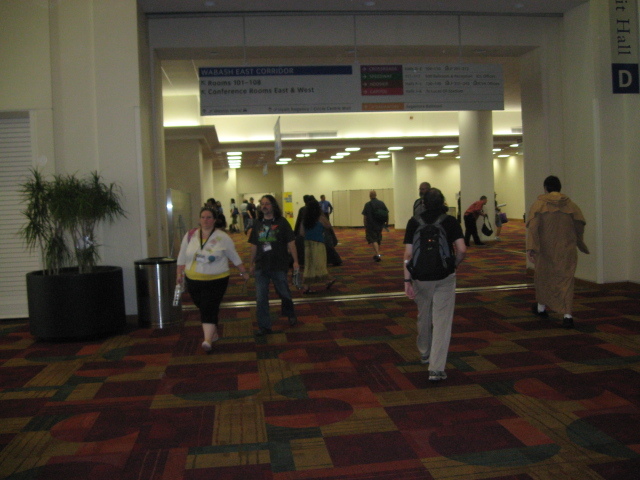 I thought the place was like a gigantic crowded maze, so I took some pictures to show you what it was like in the halls. 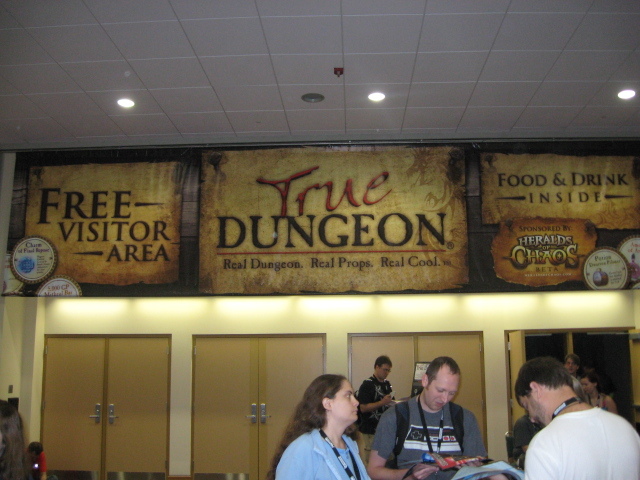 And then we came to the entrance to the True Dungeon. Talk about larping. A ticket to walk thru and play that game cost $34. I wanted to explore the True Dungeon. I didn’t have time to buy a ticket and wait around hoping to join a delving party, but I was able to walk around in the free area and take these shots. 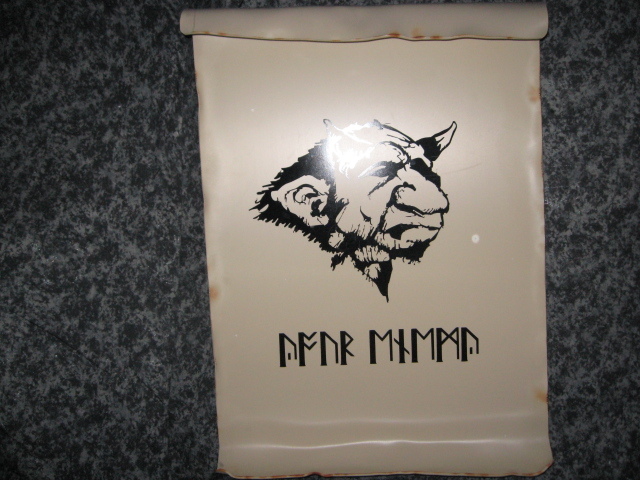 Obviously a poster of a goblin . . . I wonder why? It was dark inside. D’oh! Delvers waiting for a trip counted their tokens and prepared for the ordeal. 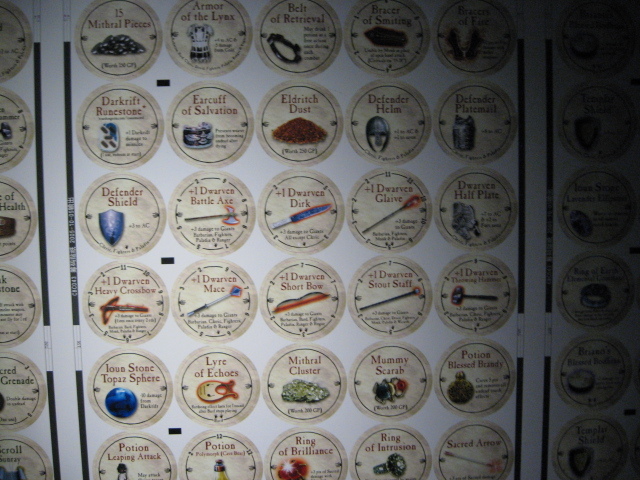 A chart showing some of the tokens you might win or purchase inside the dungeon. Tokens represent treasure in this game. Out of the dungeon and back in the labyrinth. 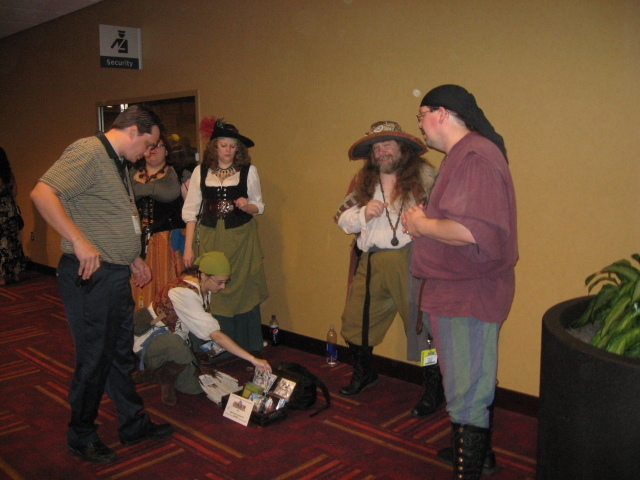 Some adventurers pausing between adventures. The maze goes on and on. 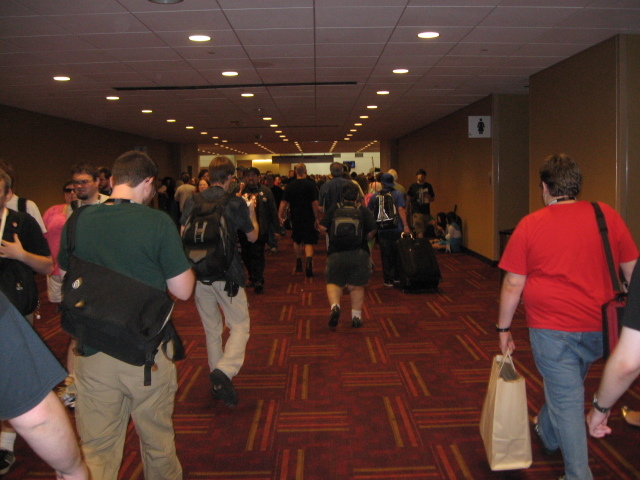 We were working our way back to the Exhibitors Hall. 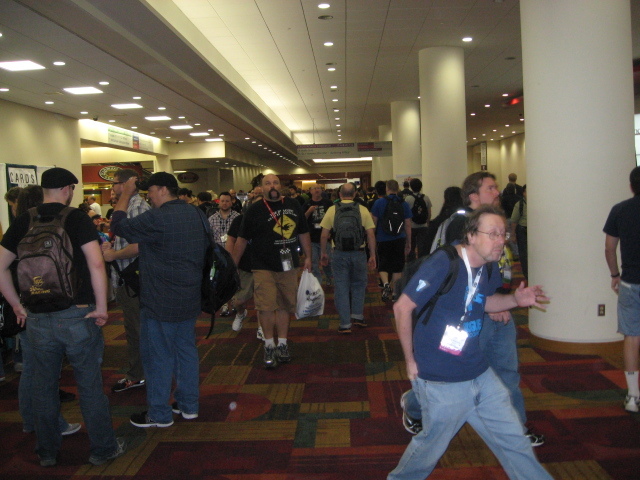 Yes, this is really what GenCon looks like in most places. There were plenty of hall costumes. These lovely ladies were showing off. 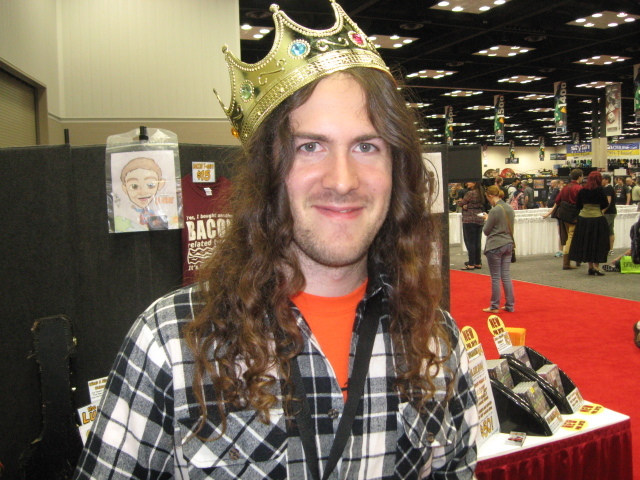 I don’t understand the hair tentacles. 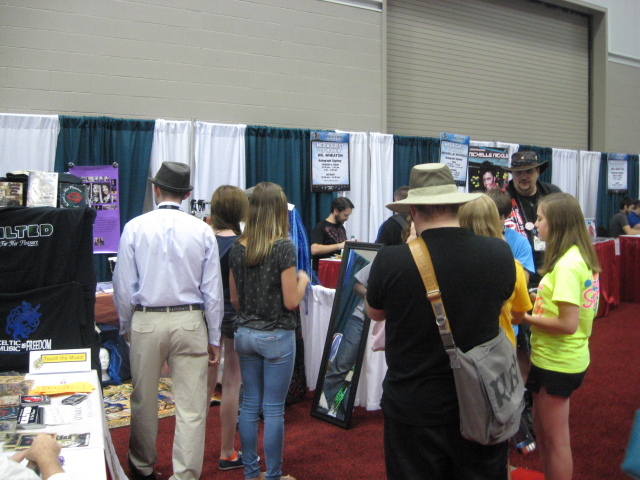 The Exhibitors Hall (i.e. 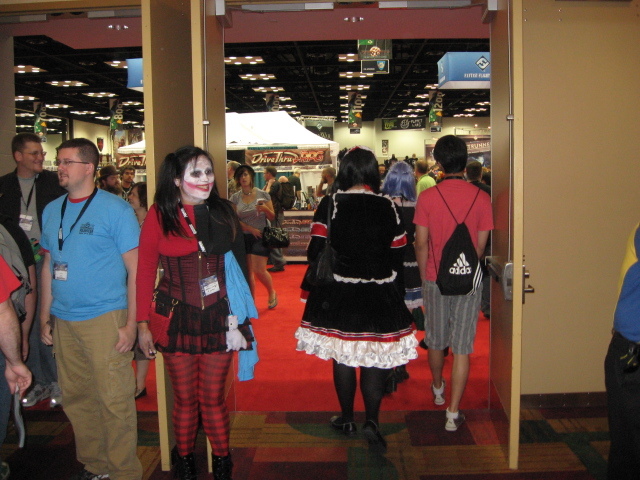 Dealer Room) was guarded by a zombie when we entered. 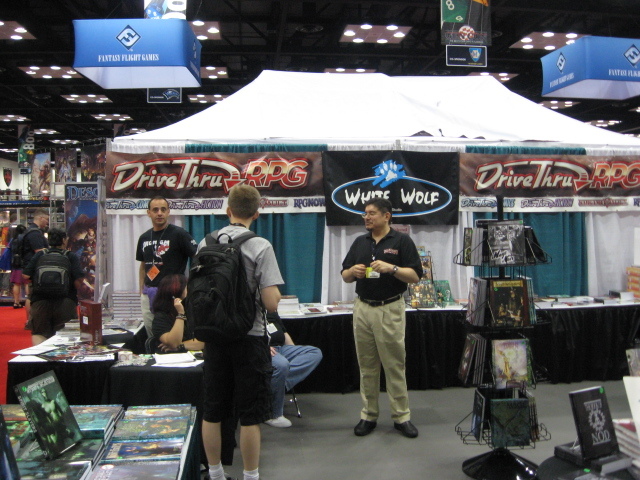 White Wolf shared a booth with Drivethrurpg.com. I probably should have gone in and talked to them considering how many of my products are on drivethru . . . but I didn’t. Later in the afternoon, James and I met Daniel–a musician (drummer) and a Magic player. We wanted to try out our Magic decks against him, but never got the chance. Seems like whenever we saw him it was time for his band to go out in the halls and play music. I heard them play. They were pretty good, doing a weird kind of folk rock. Wil Wheaton was at the Con. He seemed to spend most of his time in the autograph area signing things. Autographs were free and there were several notables including Nichelle Nichols of the first Star Trek series. She has snow white hair now, and is very thin and aristocratic looking. Later, I gave Will a D6 that I brought back from OSRcon with me–one from the Argh gaming club with a coat of arms on it. He admired it, said thanks, and tucked it away where it will probably never be seen again. After leaving Wil, I went and talked to this pretty elf. 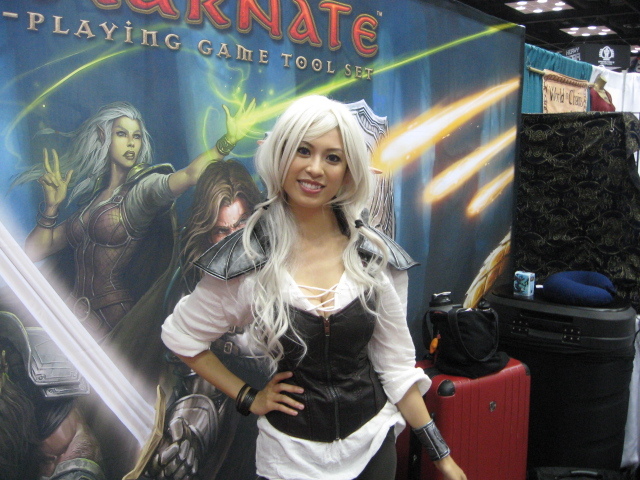 She was helping to promote a Game Master’s software program–keep track of everything on your laptop when you run a frp game. There were elves all over the convention, and especially in the Dealer area, but she was the most beautiful one I met. 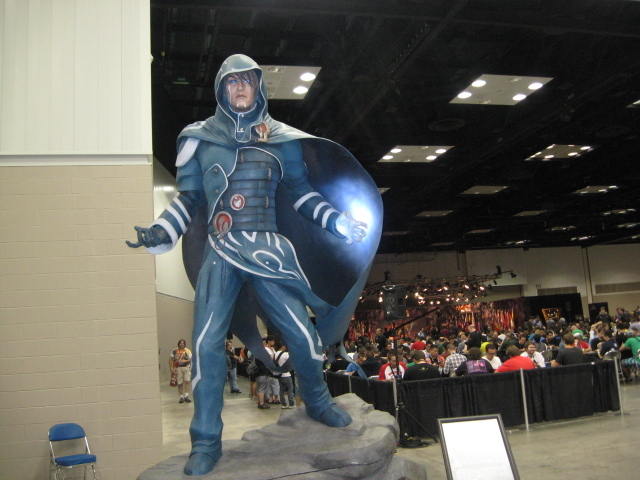 There were many heroic-sized statues located in the Exhibitors’ Hall and some of the dedicated gaming areas. Here’s a magical hero of some sort. 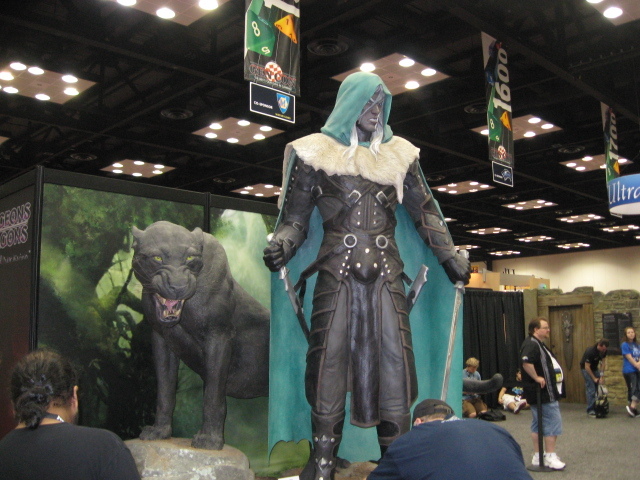 Speaking of elves, here’s Drizzt do Urden and his kitty cat guarding an exit from the Dungeons and Dragons (which I have dubbed “That Other Game”, area in the hall. I managed to sneak in past him. I didn’t care at all about the products. I just wanted to see and admire the statues. 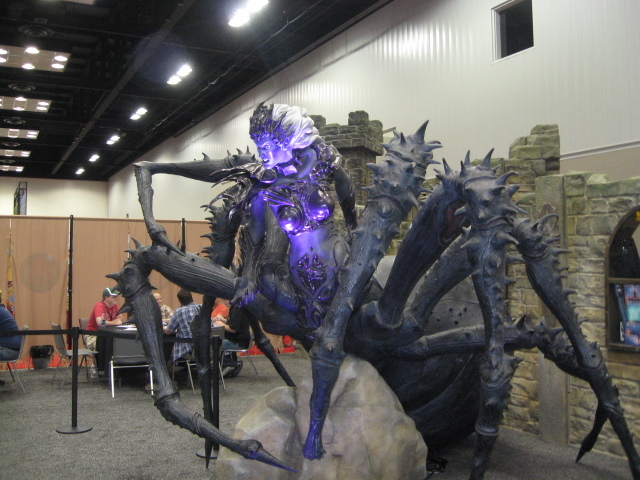 10% sorceress, 90% giant spider thing. I’m glad she wasn’t hungry. And that seems like a good place to break off today’s GenCon narration. It was a very busy day. 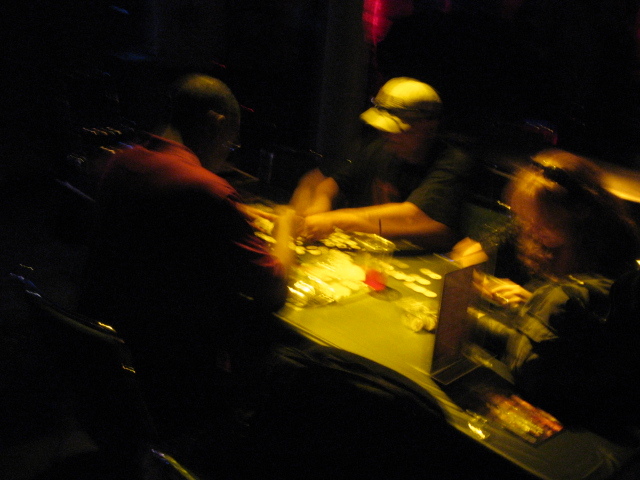 The dealers seemed to be doing well, and the gamers seemed to be having fun and spending money. Yay! Spending money! That’s what it’s all about for the many game publishers and manufacturers at GenCon. For the rest of us, it’s a kind of huge carnival crowd scene with wonders in all directions.